The College Football Playoff picture appears to be coming into view, but there are still a few more weeks to go where just about anything can happen. This past weekend saw our top Playoff contenders absolutely shredded and decimated their opponents, so not much changed in our overall Playoff outlook. But be careful if you think the Playoff field is set just yet. Crazy things can happen when you least expect it. Which one-loss team has best shot to make the College Football Playoff? Here are your candidates: Louisville, Ohio State and West Virginia (sorry, Boise State). Which one has the best chance to reach the College Football Playoff? Without any hesitation, it is Ohio State. That is because the Buckeyes will get a crack at undefeated Michigan in the final game of the regular season at home. If any team in the Big Ten is going to give Michigan a run, it will be their rivals in Columbus. And if Ohio State plays the way they did against Nebraska, these Buckeyes could very well hand Michigan its first loss of the season. That would also likely send Ohio State to the Big Ten championship game for a potential rematch with Wisconsin (or Nebraska? 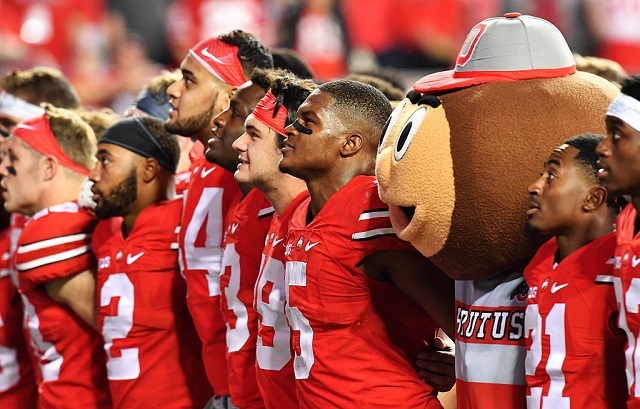 ), and the Buckeyes would be the favorites in Indianapolis as well. Louisville is very likely going to be shut out of playing for the ACC championship, as Clemson could wrap that up this weekend. Lamar Jackson is still the Heisman Trophy front-runner and the Cardinals are still going to be in the New Years Six lineup in all likelihood, but the playoffs are going to be just out of reach for the Cardinals otherwise. Even a one-loss Michigan, under this scenario, could manage to stay ahead of Louisville in the eyes of the selection committee. West Virginia would need a ton of help, because the Big 12 is clearly not respected in the eyes of the selection committee and voters. Oklahoma may be creeping their way back up the rankings after a disastrous start to the season, but the Mountaineers have quite an uphill battle to climb, especially with two-loss teams ranked ahead of them already. Looking for a two-loss team to hit into high gear at the best possible time and sneak into the College Football Playoff? Look no further than Auburn and Wisconsin. The College Football Playoff rankings had each ranked at No. 7 and No. 8, respectively, last week and they should each move up at least one spot this week with No. 4 Texas A&M losing on the road. I suspect the Aggies will get punished slightly more harshly for their recent loss, compared to the AP and coaches polls, but both should easily bypass the Aggies Tuesday night. Both teams absolutely have to win their conference championship game, but the good news is each has control of their conference title destiny at this point of the season. For Wisconsin, the Badgers hold a head-to-head tiebreaker in the Big Ten West with Nebraska and will have games against Illinois and Purdue before closing out the regular season with Minnesota. (The Gophers are also currently tied for first in the division.) Wisconsin is 21-0 against those three programs since 2008, so the odds are certianly in Wisconsin’s favor, if history is any indication. That would set up a rematch against one of the two teams to hand them a loss this season: Michigan or Ohio State. Either one would be ranked in the top three for the Big Ten championship game, having beaten the other the week prior. Remember that Wisconsin played Michigan the toughest all season and took Ohio State to overtime. Could a third time be the charm for the Badgers? And what about Auburn? The Tigers have been on a roll since losing to Texas A&M back in Week 3. Since starting the year 1-2 with losses to Clemson and Texas A&M (both at home), Auburn’s running game has found its rhythm and the defense has been playing very well. Auburn did just have a scare against Vanderbilt this weekend, but should be able to get out of Georgia with a win this week, cruise past a late-season FCS opponent next week and then give Alabama all it can possibly handle in the Iron Bowl. You know the Iron Bowl, right? Crazy things happen there, and they tend to favor Auburn in recent years when they do happen. Alabama may be in a league of its own, but Auburn will not be intimidated and could be riding the hot streak needed to give the Tide a genuine scare. Beat Alabama in the Iron Bowl, and the SEC East should not be a threat in the SEC title game. Two-loss SEC champion in the playoff? Yeah, probably. Two-loss Big Ten champion? Given where Wisconsin ranks now, maybe. CHAOS! Alabama shut down LSU like it was in the 2012 BCS National Championship Game. 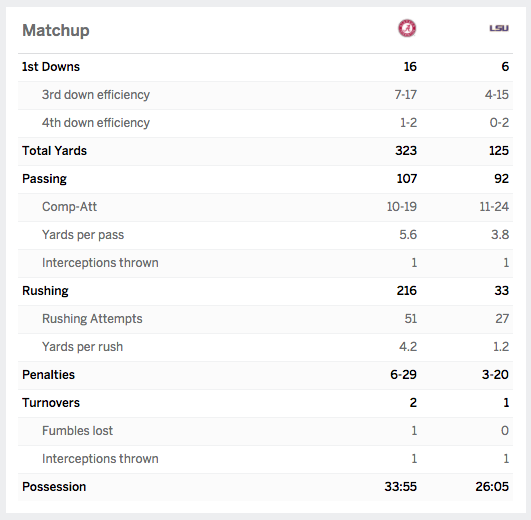 If you had any doubts about just how well Alabama’s defense can shut an opponent down, take a look at that box score. The Crimson Tide allowed just 125 yards of total offense to the Tigers. That included 33 rushing yards, and Leonard Fournette accounted for 35 rushing yards (that is not a typo). Alabama can beat you a number of different ways. If they need to, they will win a shootout. But if they need to win a defensive slugfest, you better believe they will be up to the task. 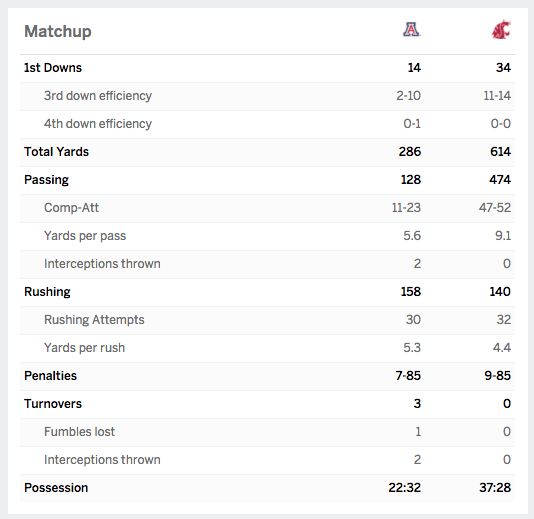 Luke Falk passed for 311 yards and four touchdowns, which was more than Arizona could do all night. It is just amazing to me that Washington State lost at home to Eastern Washington this season. All eyes are set on Western Michigan, but in the event of an upset to the Broncos between now and the MAC Championship Game, it looks as though San Diego State is ready to step right into the spotlight out of the Mountain West Conference. San Diego State clinched a spot in the MWC Championship Game this weekend and will now play for a chance to host the conference title game likely against either Wyoming or Boise State. Should the Aztecs finish the season with a 12-1 record with the MWC crown, they would absolutely be the next team in line behind Western Michigan. That is because the American Athletic Conference is picking itself apart and allowing a one-loss MWC champ and an undefetaed MAC champ to take advantage of its cannibalism. No team in the AAC has fewer than two losses and the conference championship game could be played between two teams with three losses. That’s bad news for the AAC, and fantastic news for the MAC or the MWC. Penn State and Colorado in the Rose Bowl would be pretty fun to see, and full of redemption storylines to follow. The fact I can throw Penn State, Colorado and Rose Bowl in the same sentence is pretty remarkable. I have said this before, but I will say it one more time. 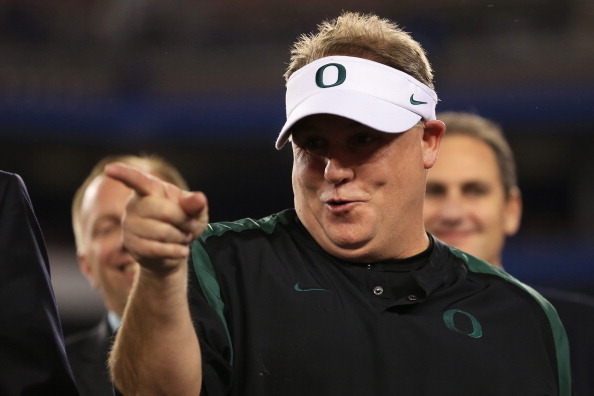 Chip Kelly, come on home to college football. Kelly is off to his worst start as a head coach in the NFL, now with his second team in San Francisco. As much as I wanted to believe Kelly would do some good things in the NFL since leaving Oregon to take a job in Philadelphia, even I must admit I was wrong and start to think about where Kelly goes after this job in San Francisco comes to an end. It just so happens things are stirring in Oregon that make talk of a reunion between the two somewhat interesting to discuss. Nike founder and Orgeon alumnus Phil Knight reportedly wants to pay whatever price necessary to bring in a head coach that can deliver a national championship at Oregon. It is clear the pressure is rising on Mark Helfrich, who is on track to have a losing season in Eugene two years after taking the Ducks to the national championship game. Whether you want to believe the report suggesting Knight would pay $10 million to a top-of-the-line coach or not is up to you, but you have to imagine Knight would pay whatever is needed to make an improvement at head coach. Kelly’s name is going to be floating around plenty of coaching rumor mills this offseason (remember, his show cause from his time at Oregon has already expired), although the word from the NFL is that Kelly has no intention of leaving to return to the college game. But let’s be clear, the time may come soon where that is not his decision to make. Whether the 49ers ditch Kelly after one year remains to be seen, but Kelly’s time in the NFL may soon be approaching an expiration date and college jobs may be the only ones left available for him. A reunion with Oregon may be a reach, but it also just feels so right if Helfrich isn’t going to be the guy. Sometimes you can go home, and Kelly returning to Oregon just feels like a natural fit. Next in line? Michigan and Louisville. No changes by me from last week’s assessment and projection. No mailbag this week, but feel free to send in your questions for next week’s column! Submit your questions in the comment section below and I’ll attempt to satisfy you with my answer in next week’s column, or send you into a fit of rage. You can also tweet your questions to me on Twitter (@KevinOnCFB).